The goal of Z-OptimiZr for SharePoint Databases (Z-OptimiZr SP DB) is to reduce the size of the files already stored inside your SharePoint server document and picture libraries. Native XML File Optimization for all MS Office XML files like DOCX, PPTX and XLSX files stored in your SharePoint libraries. 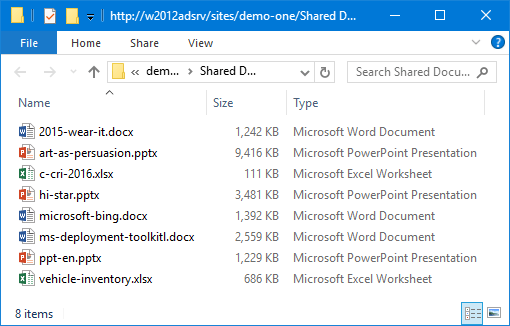 Native File Optimization for all DOC, PPT and XLS files stored in your SharePoint libraries. Native image optimization for JPG files stored in your SharePoint libraries. Z-OptimiZr for SharePoint Databases installs and runs on your SharePoint servers. It is provided under the form of an executable Windows program running in batch mode (it does not run inside SharePoint) that can be easily scheduled and run against the document and picture libraries of your choice. When Z-OptimiZr SP DB has finished an optimization task, it completely unloads from memory. Files consume most of the SharePoint disk space. Reducing by 50% on average the size of all MS Office files and JPG files stored on your SharePoint servers drastically reduces the amount of disk space consumed by SharePoint. Smaller SQL databases helps your SharePoint servers performing faster. 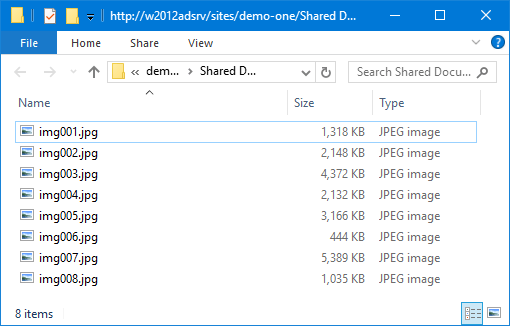 SharePoint library files made smaller by Z-OptimiZr SP DB are extracted faster from the SharePoint server databases and downloaded faster by the users. For a given file made 2 times smaller by Z-OptimiZr SP DB, SharePoint server will consume 2 times less resources (Disk space, CPU, disk IO, network, processing time…) and this during the complete life cycle of this file. Smaller files are accessed and downloaded faster. Downloading smaller files consumes less network bandwidth. Z-OptimiZr Real Time for SharePoint is a member of the Z-OptimiZr for SharePoint software suite for SharePoint storage optimization and performance improvements. Each of these 4 solutions is fully independent and can be licensed and installed individually. What is Z-OptimiZr for SharePoint Databases? The Z-OptimiZr Real-Time optimization engine is provided under the form of a Windows executable program. Installing the Z-OptimiZr Real-Time optimization engine is extremely easy, you only need to copy this program in a folder of your choice on a SharePoint server having access to the document and picture libraries you want to optimize. Z-OptimiZr SP DB functioning parameters are provided through a parameter file. This parameter file is in text format and can be easily edited with any text editor. A parameter file containing the list of all Z-OptimiZr SP DB parameters, self-documented with comments related to each parameter, is delivered with the product. How does Z-OptimiZr for SharePoint Database work? Very easy, simply launch ZOptSPDB.exe! Yes, all you have to do is to launch the ZOptSPDB.Exe program and pass the Site Collection(s) and/or the Librarie(s) you want to optimize through the command line (wildcards are supported). You can also pass the path of a parameter file listing the Site Collections and Libraries you want to process. Once launched, ZOptimiZr SB DB starts optimizing the files contained into the specified SharePoint Site Collections and Libraries. Files are processed by chunks of n files (you can specify the number of files per chunk in the Z-OptimiZr SP DB parameter file). Files being processed are locked in read-only mode for the other SharePoint users. Files currently locked by other users or processes are skipped and will be reprocessed later. Z-OptimiZr SP DB preserves all files metadata after optimization. Thus the optimization of the files is fully transparent for the SharePoint users. They will see no difference in the SharePoint views displaying the optimized files (same file authors, same file dates and times etc.). For each given file, Z-OptimiZr SP DB optimized the current version of the files as well as all of its precedent versions if any. Metadata are also preserved for the precedent versions of the file. Z-OptimiZr SP DB processes the SharePoint files (library folder per library folder) starting with the oldest files first. It remembers, for each library folder it has processed, the date/time of the last processed file. So, when the incremental mode is switched on, the next time Z-OptimiZr SP DB processes a given library folder that was already processed in the past, it can very quickly skip the files that were already processed without having to open them again. The Z-OptimiZr SP DB processes can be interrupted at any time by using the STOP_ZOptSPDB.exe program. Thus it is very easy to schedule Z-OptimiZr SP DB during given hours. Simply launch ZOptSPDB.exe to start it and STOP_ZOptSPDB.exe to stop it. In Test Mode, Z-OptimiZr SP DB performs the optimization of the files stored into the SharePoint libraries to process but it does not replace the original files by their optimized versions. Thus you can know what would be the volume reduction results delivered by Z-OptimiZr SP DB on any given library of your choice without having to optimize the files for real. This is a quick and easy way to evaluate Z-OptimiZr SP DB before to buy it. Z-OptimiZr SP DB can be configured to produce detailed log files and statistics (even when launched in test mode). An application is provided to display the cumulated savings in real time. What kind of volume reduction results is Z-OptimiZr for SharePoint Databases able to deliver? Display these MS Office files before and after optimization or download them on your PC to compare the optimized and non-optimized versions. Display these picture files before and after optimization or download them on your PC to compare the optimized and non-optimized versions. In the above test, the image files were optimized without being resized. Thus the optimized pictures have the same width and height in pixels as the original pictures. And as you will see if you have a look at these files, their rendering quality is fully preserved. In the above test, the pictures were optimized and resized smaller to match a HD (1920 x 1080 pixels) frame. Although in this case, the optimized pictures have smaller dimensions than the original pictures, this makes no visual difference to the users displaying these picture on HD screens. The reason is that when displaying pictures larger than the surface of their displays, the Windows photo viewer resizes these pictures automatically to display them (at max) full screen in the HD display frame. With file optimization and compression software, the volume reduction results always depend on the content of the files. Z-OptimiZr for SharePoint Databases is no exception to this and the above results have to be taken as examples of what Z-OptimiZr for SharePoint Databases, and our other optimization software as well, are able to achieve in terms of native MS Office and picture file optimization. It is very easy for you to evaluate Z-OptimiZr for SharePoint Databases with your own files. All you have to do is to download an evaluation copy, install it (in a few minutes, following the step-by-step instructions of the installation guide) and start using it. You can also download an evaluation copy of Z-OptimiZr Real-Time for SharePoint, our other optimization software for SharePoint servers. The purpose of Z-OptimiZr Real-Time for SharePoint is to optimize the files at the time they are received by your SharePoint servers. You can activate ii on Site Collections and Libraries of your choice and start uploading files to these libraries. The uploaded files will be optimized before they reach their target libraries. Like with Z-OptimiZr SP SB, you can configure Z-OptimiZr Real-Time for SharePoint to generate detailed log file and statistics and an application is provided to display the cumulated savings in real-time.